"I love luchi" is something nearly every bengali you know will say and my Parsi hubby says it with equal fervour. While I'd love to make luchi every week I barely make it once a year - all that white flour and deep frying has made it one the most forbidden treats of all. So it is only natural that one chooses a special day for luchis - either a birthday or anniversary, or a favourite festival. This year I was convalescing through the Durga puja after a nasty bout of the mumps and hadn't cooked any special meal or made any dessert through the puja duration. On Dussehra day - Bijoya Dashami for us Bongs - I felt a keen need to make SOMETHING at least. I couldn't let the pujas pass without putting at least one special treat on the dinner table, I just couldn't! So luchi -torkari it was. Puffy pillowy luchis accompanied by my favourite Aloo Phulkopi'r torkari. 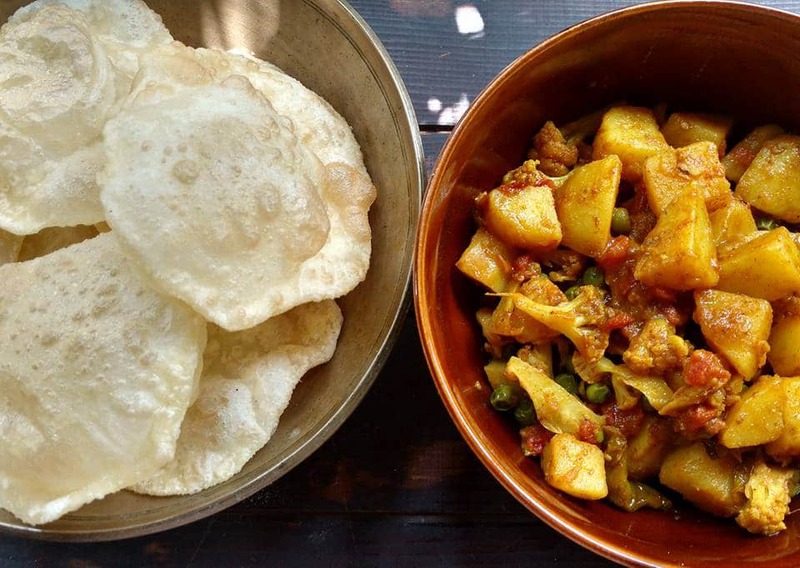 Luchis are the Bengali puris made with all purpose flour, with not a hint of any healthy whole wheat or other flour tainting its pristine complexion. The dough must have good quality ghee in it, and is kneaded with plain water. While frying the luchi you must make sure the luchis remain white with just a bare blush of brown, if at all. Of course, they must puff up like perfect little balloons. Empty the maida into a large flat bottomed vessel or platter. Add the ghee to it and mix it in with your fingers till you have a crumbly mix. Sprinkle in the salt and mix properly. Add water a little at a time and bring the dough together with your fingers. Keep kneading till you have a soft and smooth dough. Knead for around 5 minutes and then let the dough rest, covered, for 30 minutes. Set enough oil to heat in a kadai or wok to fry the luchis. Divide the rested dough into small balls, each of which will be rolled out into a luchi. Try to make these balls as uniform as you can. Dab each ball with a little oil and then roll it out into a disc around 5 inches in diameter. Roll firmly pushing the dough out and avoiding folds as you roll. Place the disc as flat as possible into the hot oil and gently push it down with your slotted spoon to make it puff up nicely. Flip it over quickly and fry the other side. Remove the luchi to a plate and proceed in this fashion till you have fried all the luchis. There is a skill in making perfect luchis. Remember to let the dough rest. You will get a more pliable dough and will find it rolls out better. Use a firm and confident hand when rolling out the discs and try to roll as uniformly as possible avoiding thick edges. A uniformly thin disc will make for a perfectly puffed up luchi. Make sure there are no folds or tears in the rolled out disc. Once the oil is nice and hot reduce the heat to medium and maintain that temperature. If your oil is too hot the luchi will turn brown and not cook properly. If the oil is not hot enough the luchi will absorb loads of oil and will not cook fast enough, nor will it puff up. Practice makes perfect and if you're like me, making luchis just once a year, don't worry if the luchis are not perfect to start with. Just keep the above tips in mind and you will have beautiful 'phulko luchi' in no time!